The adult assassin bug is ½ to ¾ inch long and is an effective predator of insect pests. Nymphs, or immature forms, of this bug resemble the adult, but with undeveloped wings. This bug represents incomplete metamorphosis: egg, nymph, adult. 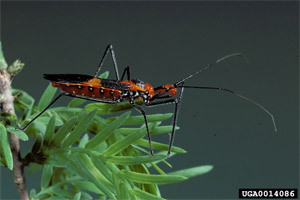 Although the assassin bug has no interest in you, handling it may result in a painful bite from its pointed, sucking mouth.